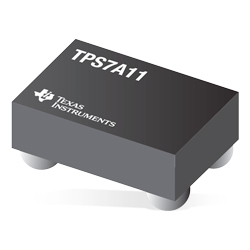 Texas Instruments TPS7A11 Ultra-Low Dropout Linear Regulators can source 500mA with an excellent AC performance (load and line transient responses). This device has an input range of 0.75V to 3.3V, and an output range of 0.5V to 3V with a high accuracy of 1.5% overload, line, and temperature. This performance is perfect for supplying power to the lower core voltages of modern MCUs and analog sensors. The primary power path is through the IN pin and can be connected to a power supply as low as 140mV above the output voltage. This device supports very low input voltages with the use of an extra VBIAS rail that is used to run the internal circuitry of the LDO. The IN and BIAS pins consume a very low quiescent current of 1.6µA and 6µA, respectively. The low IQ and ultra-low dropout features help to improve the efficiency of the solution in power-sensitive applications. Ideal applications include smart watches, fitness trackers, wireless headphones and earbuds, camera modules, smart phones and tablets, portable medical devices, and SSDs.